Let our clients tell you why The Backsmith: Chiropractic Clinic is the Best in Town. After the first adjustments by Dr. Smith the numbness in my hands diminished. The numbness in my left hand decreased the most. I had gotten to the point where after playing guitar for 10 minutes my left hand would be totally numb. It’s not totally normal yet but has vastly improved. 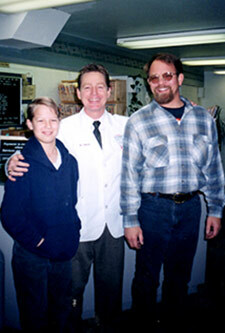 When I began visiting with Doctor Smith I had some really bad neck and back pain. I had been getting treatment for a couple weeks and one weekend I experienced some arm weakness and numbness that also gave me some headaches. The next day when I came into see Dr. Smith he told me about this emotional muscle testing that he would like to try on me. I agreed to it and I was amazed because after the treatment all the pain and weakness in my arm was gone. I am still in the process of working with Doctor Smith with this emotion testing and each time it had made differences! When I came in to see Dr. Smith, I had been suffering from tension headaches 3 to 4 times a week. This problem started back when I was in Junior High School. I also had sciatica pain in my left leg which started 2 years ago. I haven’t had a headache for a week and my sciatica pain is decreasing with each visit. Thank you Dr. Smith! For about 6 weeks, I was having really sharp pain up and down the right side of my back just below my shoulder blade. When I first came in Doctor Smith did a few adjustments and it did seem better. Then decided we should do some x-rays and found my spine was out of alignment , so a couple more treatments and I am feeling great. In April of two thousand and eight I went to a concert and a girl was body surfing and landed on my neck. My neck hurt for a while but then I got a little better. As months passed by my neck hurt and my lower back was in pain. And every now and then I would get a sharp pain in my neck. I finally decided I needed to see a chiropractor. I’ve been seeing Doctor Smith for about 4-5 months now and I haven’t had any pain in my back, neck or shoulders since we started our treatments. I feel great! Before I started coming to Dr. Smith I had upper back pain. Also, My left arm would go numb. The doctors told me that I had carpel tunnel in my left arm. Since I have been coming to Dr. Smith it has helped. I don’t have the back pain or the numbness. You have made my life wonderful. At least now I don’t have to have surgery for the carpel tunnel. I like coming to Dr. Smith because I may walk in with pain but I will walk out feeling better. Thanks Dr. Smith. I had been suffering from pain in my upper back, between my shoulders blades since my senior year of high school, due to a wrestling injury. I had seen another chiropractor just after the incident but I thought the pain was something I would have to live with. After a handful of visits to Doctor Smith the pain went away. It has been six months with on pain in my upper back after living with it for ten years. Thanks Doc. After two open heart surgeries and eight years of pain in my chest, I was at the end of my rope. The doctors told me that I had “Phantom Angina” and it was a small price to pay for a second lease on life. My wife made me go to Dr. Smith. He checked me out and said I had ribs out of place. When he “popped” my back and chest it snapped so loud and hurt so bad I thought I was done for. Then I stood up and the pain in my chest was gone. I needed several adjustments because the muscles were trained after eight years to sit differently. His treatment cured the “Phantom Angina” and solved a lot of problems. Before I met Dr. Smith I couldn’t lay down flat because my lower back hurt bad enough to bring me to tears. I experienced Migraines 3-4 times a week and had extreme sensitivity to light. To put things short, I was in a constant state of pain and always in a rotten mood! Dr. Smith found I had a reverse curve in my neck and several disc wedges. He worked with me to fix those problems. In addition to helping my chiropractic problems, he worked to improve my overall health.